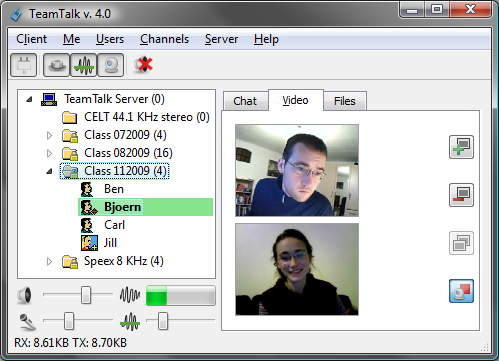 TeamTalk 4 is a freeware conferencing system which allows users to participate conferences over the Internet. Users can chat using voice and webcam as well as share desktop applications, like e.g. PowerPoint or Internet Explorer. The TeamTalk 4 install file includes both client and server application. Special client application included with accessiblity features for visually impaired. Having these features available makes TeamTalk 4 an excellent choice for online presentations, attending meetings or just do every day chit-chat with friends and collegues, whether they are next door or around the globe. TeamTalk Channels - To use the TeamTalk conferencing system users must either set up their own TeamTalk server or connect to one of the servers which are publicly available. Audio and Video Conversations - TeamTalk supports multiple video sessions so it's possible to see video of every user in a channel. Qweas is providing links to TeamTalk 4.3 as a courtesy, and makes no representations regarding TeamTalk or any other applications or any information related thereto. Any questions, complaints or claims regarding this application TeamTalk 4.3 must be directed to the appropriate software vendor. You may click the publisher link of TeamTalk on the top of this page to get more details about the vendor.